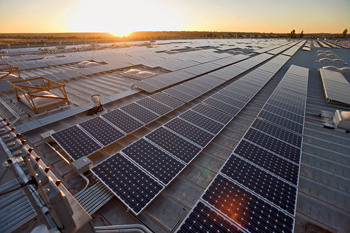 United Natural Foods Inc. is going natural with solar power for a California warehouse, the sixth largest solar array in the United States. As the largest publicly traded wholesale distributor of organic and natural products in the United States, United Natural Foods Inc. has adopted a philosophy to embrace environmentally friendly practices when they also make sound business sense. So installing 175,000 square feet of solar photovoltaic panels atop the company's Rocklin, California, facility to generate 1.19 megawatts of electricity-and reduce the company's greenhouse gas emissions-just seemed like a natural fit. "We're a company that's always been conscious of and supportive of a lot of environmental initiatives, and we see the solar power project in Rocklin as just us stepping up the efforts," says Tom Dziki, United Natural Foods vice president of sustainable development. "We saw solar power as just a great way to go out and take a big bite out of our energy consumption." But Dziki says solar energy wouldn't have been nearly as attractive if it weren't for California's solar power rebate program. He figures the return on investment for the project will be about 4.3 years, taking into account federal tax credits and the $2.1 million California rebate. United Natural Foods is also able to take advantage of accelerated depreciation on the project. "So it's a very quick payback," Dziki says. "If it weren't for the leadership of the State of California, I don't think we would be talking about the solar project today." The solar panels have a 25-year warranty, "so we're going to get 21 years of free, clean energy," he says. "We look at that as a long-term investment." United Natural Foods, based in Dayville, Connecticut, acquired the 478,000-square-foot Rocklin warehouse-which was once occupied by Ace Hardware Corp.-nearly three years ago and moved its nearby Auburn, California, distribution facility to the new site. Of the overall floor plan, about 25,000 square feet is devoted to a freezer, which holds temperatures at about 14 degrees below zero Fahrenheit. The Rocklin distribution facility is the headquarters for the company's western region and employs about 550 workers. It's also the largest of the 10 facilities within the company's distribution network. The Rocklin facility serves customers in Northern California, northern Nevada, southern Oregon and Hawaii. Nationwide, United Natural Foods handles more than 40,000 natural and organic products, including groceries, vitamins and nutritional supplements, frozen and perishable foods, and personal-care products. Once United Natural Foods leaders made the decision to move forward with the Rocklin solar project, Dziki says he contacted five or six companies who specialized in solar installation and project management and asked them to submit proposals. In the end, he says United chose American Capital Energy of North Chelmsford, Massachusetts, because of the "value the company brought to the table." American Capital acted as the overall contractor, doing the engineering, permitting, system design and project management, says Tom Hunton, president of American Capital Energy. A California subcontractor did the electrical work and installation. "We like that model because we're a national company, so we want to make sure there are boots on the ground-people who we know and who we can rely on in case there are any problems," he says. With most commercial solar projects, the project manager would first conduct an energy audit of the facility to determine how much energy could be saved through simple changes, such as installing more energy efficient lighting. Then it would determine the appropriate size of the solar installation, based on the reduced energy needs. But Hunton says that wasn't needed with the United Natural Foods project. The Rocklin facility was already using an ammonia refrigeration system that was the most energy efficient for a large commercial warehouse. The company had replaced all of the older lights in the building with more energy efficient T8 fluorescent bulbs and had installed motion sensors to shut them off when they weren't needed. "United Foods is very advanced when it comes to energy efficiency, so we just looked at solar because they're already doing everything else," Hunton says. 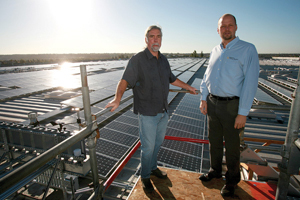 Michael Funk, (left) president and CEO of United Natural Foods, and Tom Hunton, president of American Capital Energy, stand next to the new four-acre solar electric system installed on the roof of United Natural Foods' distribution center in Rocklin, California. Even before they decided on a subcontractor, Dziki says they contacted a structural engineer to determine what type of solar installation would be best suited for the building's seamed metal roof. Based on the engineers' report, American Capital Energy decided upon a Unirac S-5 mounting system for a non-penetrating and low-profile installation. "It's simple and penetration free," Hunton says. ** The solar mounting system was also designed to withstand winds of up to 90 mph and ensure that the panels stay on the roof and aren't lifted up. Of the four subcontractors who submitted bids, American Capital chose Erickson Solar of Placerville, California, for the electrical work and installation. Hunton praised Erickson Solar for its "absolutely first-rate" work that helped complete the project in short order. Actual construction began in mid-July 2007. The more than 7,000 Sharp 170-watt multi-crystal panels installed on the roof were purchased from Schott Solar Inc. in nearby Roseville, California. The proximity of the solar panel source helped speed installation, Hunton says. "We managed to get the panels in eight weeks," he says. Two SatCon 500 kW inverters convert the energy to AC power. During the day, the solar panels feed enough energy into the Pacific Gas & Electric grid to offset what the distribution facility uses. United Natural Foods earns credits for the electricity produced that it can then draw upon when it needs power, such as at night when the solar panels aren't generating power. Officials inaugurated the PV system this past October. With the flip of a switch, it became the fourth largest solar array in California and the sixth largest in the United States. Because the system is so new, Dziki says it's hard to tell how it's performing compared with its 1.5 MW rating. At any moment, however, he can log onto his computer in Connecticut and see how the solar generation system is performing. "There's a software tracking tool where you can look at it day by day," Dziki says. "And you can tell when it's a cloudy day." If the PV panels perform as rated, he says the company will reduce carbon dioxide emissions by 19 metric tons annually. But United Natural Foods isn't stopping there. The company recently installed a 550 kW PV system at its Dayville, Connecticut distribution facility. It is the largest solar electric system in New England, says the company. United Natural Foods took advantage of financial incentives administered by the Connecticut Clean Energy Fund for the project. In addition, United Natural Foods recently opened a 257,000-square-foot distribution facility in Ridgefield, Washington, and is seeking silver certification under a program administered by the U.S. Green Building Council. The voluntary certification program involves four achievement levels, starting with certified, followed by silver, gold and platinum. The Leadership in Energy and Environmental Design, or LEED, Green Building Rating System assigns points to different categories, such as building materials, energy efficiency, water savings and indoor environmental quality. To reach each level, the building must earn specific points. When Dziki took on the role of vice president of sustainable development nearly a year ago, he says he was charged with stepping up United Foods' efforts to become more energy efficient. "This is obviously a big part of that," he says, referring to the Washington certification goals. "One of the things we're looking at is our overall footprint as a company and what ways we could mitigate our impacts on the environment," Dziki says. "We're a leader within the natural products industry, and we're trying to push the envelope to see if there are better solutions. We're just getting started."